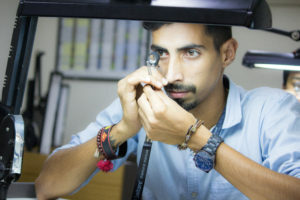 In SDI diamond grading is taught on a different level that is we teach students how to grade diamonds both on par with national and international level and also educating them with local terms and languages used in the market. We provide students with ample of real diamonds to grade which in turn makes them very well versed with every expected diamonds they come across. So, by end of the course the students would have graded minimum one thousand diamonds and the course is followed by both practical and theory exams at the end . Color–Color Grading, shading as per local market like white, off-white TTLB, TTLC, etc. Clarity – Includes Plotting, Study about inclusions and blemishes and clarity grading.